The first of my author copies have made their way through the Christmas post, so this is what elevenses looks like for me this morning: a camomile tea, a mince pie, and a flick through the new book. Cheers! This second edition of Raspberry Pi For Dummies has been updated to take account of the changes in the Raspberry Pi hardware and software since the first edition was published in March 2013. We've been able to increase the pagecount on this second edition, which has made room for three new chapters. The first covers Minecraft, and how you can use Python to build worlds in it. The example program builds a random Minecraft maze you can walk around inside, and was previously published in Raspberry Pi Projects. This book is for a different audience, so we thought it would be nice to include it here too. Watch a video of the Minecraft Maze Maker in action here. There's also a new chapter on Sonic Pi, a programming language for writing electronic and sample-based music. I had a lot of fun writing this chapter, and I've posted an extended remix of my Sonic Pi demo music here. Given the book it's for, and the demonstration nature of the track, I thought the title 'Showroom Dummies' was apt. I've uploaded it to Soundcloud, so you can listen to the Sonic Pi demo here too. To mark the book's publication, I've also created an infographic showing you the note names and numbers used in Sonic Pi and Scratch. Print it out, stick it beside your Pi, and start composing! The third new chapter is an appendix covering RISC OS. Given the rest of the book is all about Linux, we thought this topic best belonged in an appendix. It provides a short introduction to help you get your bearings on the RISC OS operating system, and will hopefully encourage you to try it out and discover an interesting alternative take on the graphical user interface. To make some room, we did have to drop the web design project that was in the previous edition. The rationale was to make room for more Pi-specific technologies. If you're looking for a guide to web design, my book Web Design in Easy Steps might be what you're looking for, and you can use Leafpad on the Raspberry Pi for coding your HTML and CSS. 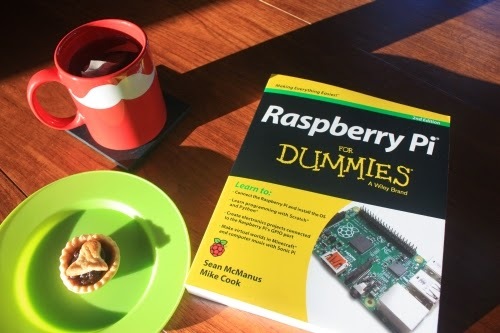 Find out more about Raspberry Pi For Dummies here, and please visit my shop for links to places where you can buy Raspberry Pi For Dummies, Scratch Programming in Easy Steps, Raspberry Pi Projects, Web Design in Easy Steps, or any of my other books. If you'd like to support your local bookshop, there's a form you can print out and take into the shop with the ISBN details on it to smooth the order process. Wishing you a Christmas filled with mince pies, Raspberry Pis, and whatever you wish for!